The new 911 Cabriolet Carrera S and 4S use the same 3.0-litre, twin-turbocharged, boxer six-cylinder petrol engine. The fabric roof folds/unfolds about a second faster than in older 911 Cabriolet models. Cabriolet looks less of a humpback. 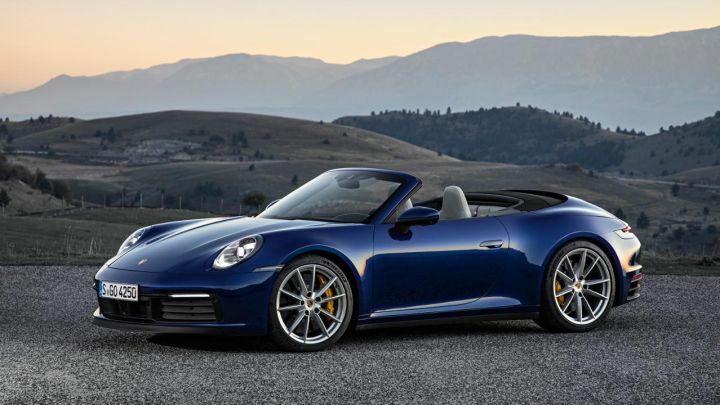 The all-new Porsche 911 Cabriolet (generation 992) has been revealed to the world. It continues the trend of incremental improvements in exterior design, but a generation change in terms of everything else. 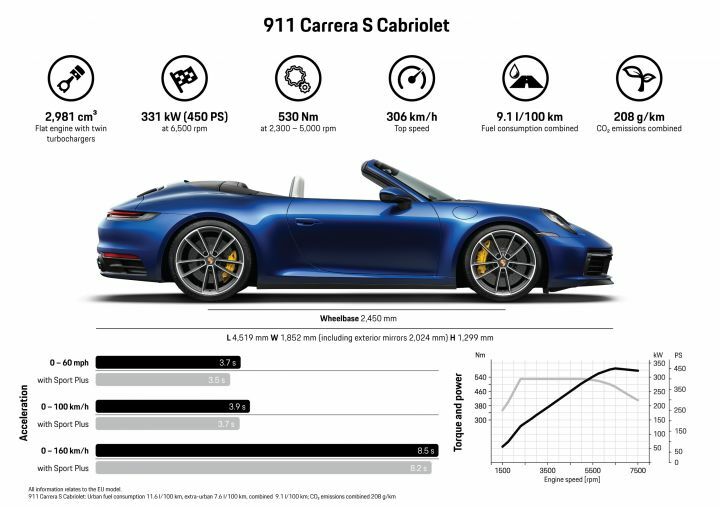 The 911 Cabriolet range has been introduced in Carrera S and Carrera 4S variants, both of which are powered by a 450PS/530Nm 3.0-litre, 6-cylinder, twin-turbocharged boxer engine - the same as the Coupe variants. The two-wheel drive Carrera S does the 0-100kmph run in 3.9 seconds, while the AWD Carrera 4S does the same in 3.8 seconds. Adding the Sports Chrono package shaves off 0.2 seconds in both the variants. 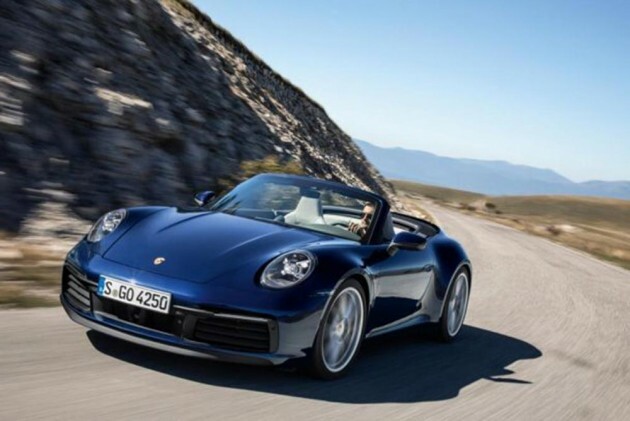 For now, both the Cabriolets are only available with Porsche’s 8-speed PDK transmission. 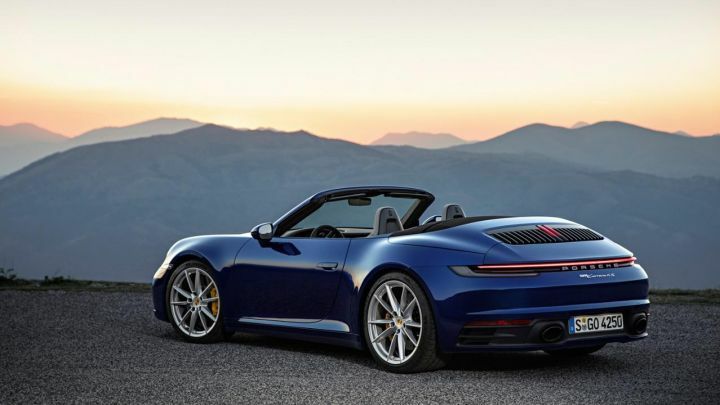 The 911 Cabriolet looks wider and more muscular than before. The highlight is the rear where the connected tail lights and vents with the centre stop lamp give the new 911 a unique look. At 12 seconds, the soft-top now deploys a second faster than in the older 991 model. The fabric roof gets an integrated rear glass windshield and is strengthened with magnesium to prevent it from ballooning at high speeds. Speaking of which, the Carrera S and Carrera 4S can achieve top speeds of upto 306kmph and 304kmph, respectively. The interior design is the same as the coupe, with increased utilisation of digital screens to give the dashboard a minimal look. It also gets camera-based AI assistance systems which detect potential collision hazards and try to prevent it by braking automatically. 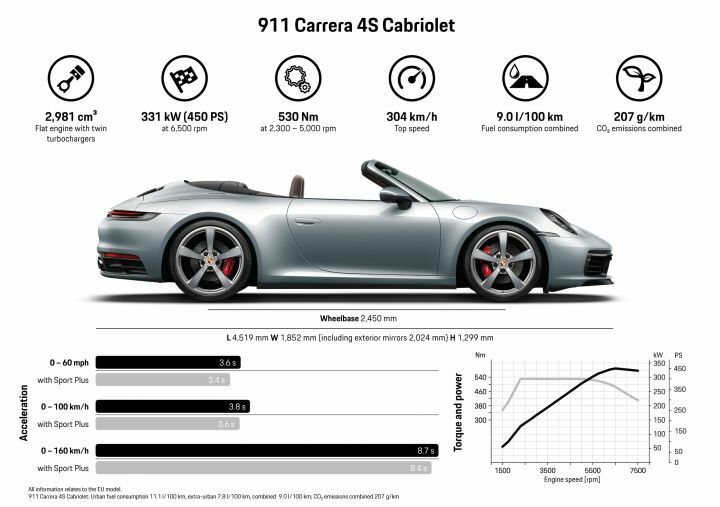 Exceptional handling characteristics are important for Porsche and the Cabriolets have been given many updates to make them as good as their coupe counterparts. This includes new engine mounting positions, the addition of the company’s signature PASM active suspension system, harder and shorter springs, more rigid anti-rolls bars and a 10mm lower chassis.